Date Various Dates (please see draw sheet). Each team shall consist of 10 players, including at least 3 women. Players must be 16 or over on the day of the match. All Players must reside in the Parish or Ward they are representing. This is because it is an Inter-Parish Competition. Appearing on the electoral roll for a Parish does not in itself constitute residency. If it is found that a player does not reside in the Parish or Ward they are representing, all points gained by the team in that event will be forfeited. Each Captain shall provide two copies of the names and addresses of their team members; this must include the full postal address of each team member. One of these should be retained by each Captain for the duration of this year’s Games. Matches must not start until both Team Captains have completed their lists. If a Parish or Ward has entered but does not then take part, the Parish or Ward will be deducted 3 points unless the Parish Captain has given the event organiser a minimum of 48 hours’ notice of non participation. All games shall commence at 8.00pm. All matches are arranged by the Competition Organiser at named venues on specific Friday evenings. 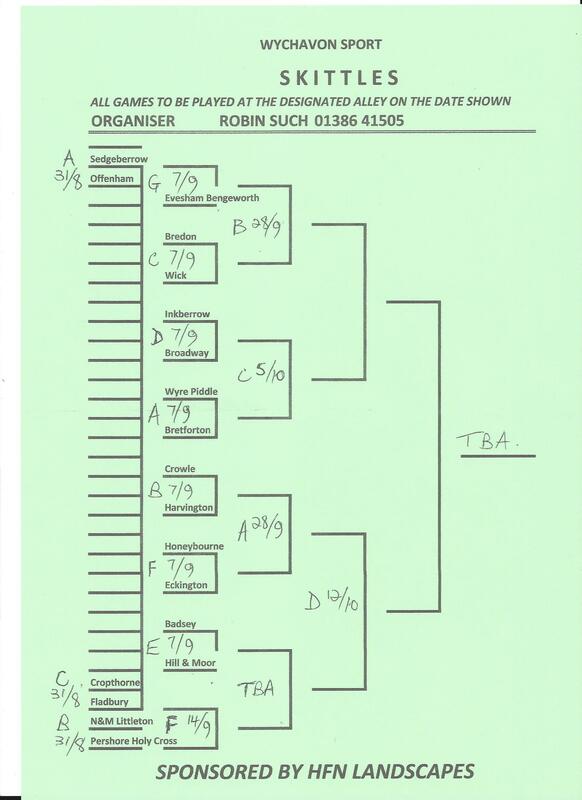 The dates and venues can be found on the Draw Sheet. The Secretary must be informed of Fridays when Parishes cannot play when the Entry Form is submitted. After that, the dates of matches cannot be changed. The Team Captains shall act as Umpires and be responsible for scoring. In the event of late arrivals for any match, a player’s position may be left open until the end of the second leg. He/she must then bowl off the legs that he/she is behind. If a team can only field nine players, the absent player will receive the lowest score of any of their team members in each round. If a team cannot field nine players, that team will forfeit the game. Each match shall be over six legs, with a member of each team alternating to bowl. If the scores are equal after six legs, further leg/s will be played until a result is achieved. Sticking up shall be shared equally by all teams. All matches must be played on the date shown on the draw sheet. Any protest must be submitted to the Secretary – Sue Collins – within SEVEN days of the match in question.